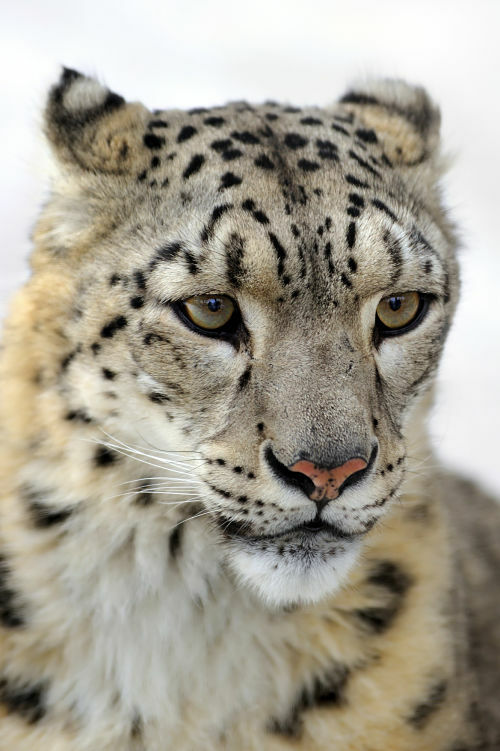 One of the saddest snow leopard facts is that this beautiful feline is an endangered species. 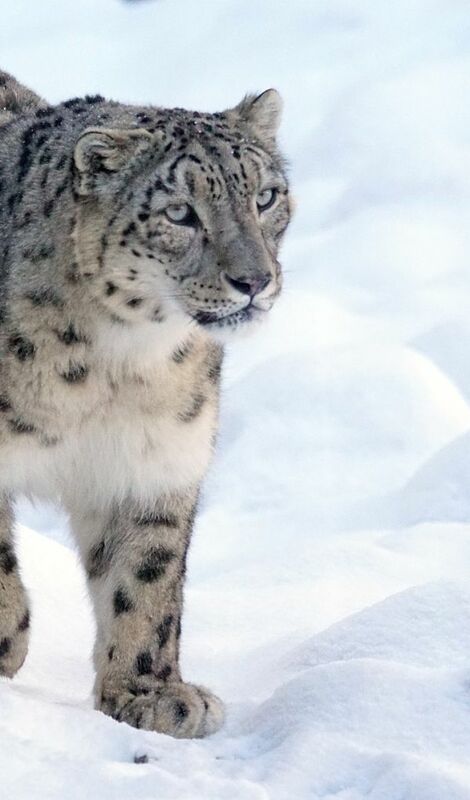 The magnificent snow leopard is native to northern and central Asia, and can be found in China, Russia, Afghanistan and several other countries. 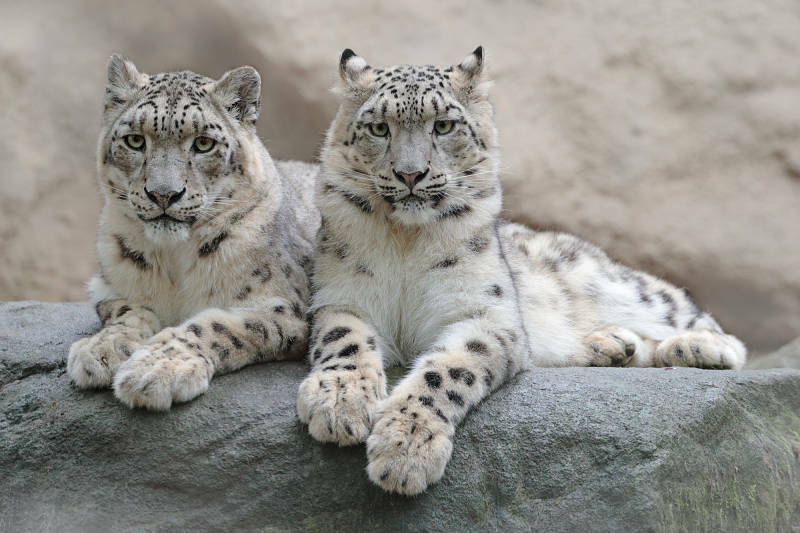 Over 60% of the world's snow leopards live in China. They are at home in the Himalayan mountains, and live in snow covered peaks as high as 17,000 feet in elevation. This is a brutally harsh environment of rocky cliffs and steep outcrops. Although they live in high elevations, they do not have the oxygen carrying adaptions of their blood hemoglobin that other high-altitude animals have. It is actually a bit of a scientific mystery how snow leopards survive at such high altitude without this modification. They are otherwise very well specialized to their habitat. Very large, powerful and flexible paws act as snow shoes in drifts, and snow tires on ice. A muscular, extra-long tail aids in balance as they climb and leap, and provides extra warmth wrapped completely around their curled up form as they sleep. They have an incredibly thick, plush coat of fur, that sheds out and fills back in again as the seasons change. And the hair coloration, brown and black spots on a field of cream and grey, allows these fairly large animals to practically disappear into their environment. The camouflage coat, coupled with their elusive nature, nocturnal habits and unfriendly habitat, make them a very rare sight in the wild. 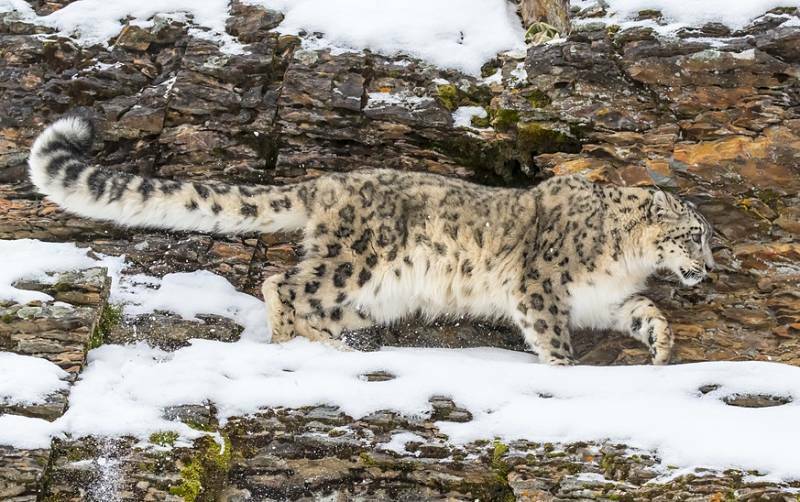 But humans, particularly goat farmers, are pushing further into the snow leopards terrain. Wild species of goat are one of the prime food sources of the snow leopard, and as humans encroach, the leopards are hunted down to protect goat herds and other livestock. The leopards magnificent coat can also be worth several hundred dollars on the black market. For some people, that is more than they earn in an entire year. So, it is estimated that less than 6,000 snow leopards exist in the wild. And they are spread out over hundreds of thousands of square miles of hostile terrain, making reproduction, management and conservation, extremely difficult. 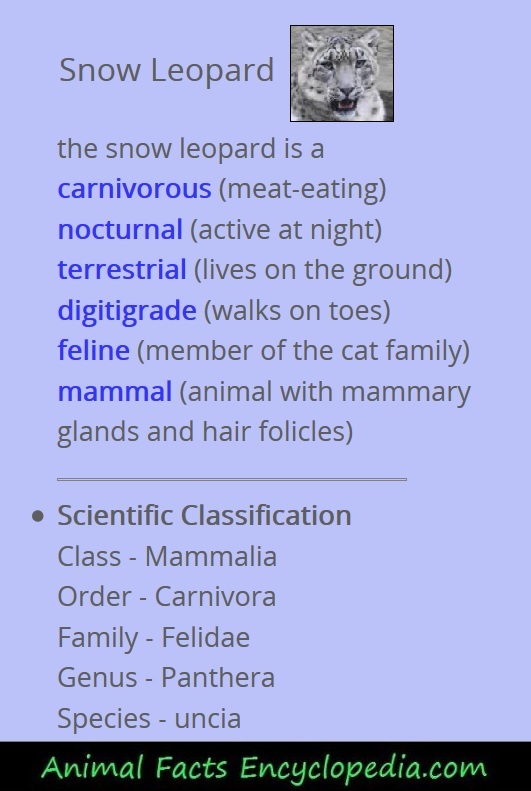 is the snow leopard really a big cat? 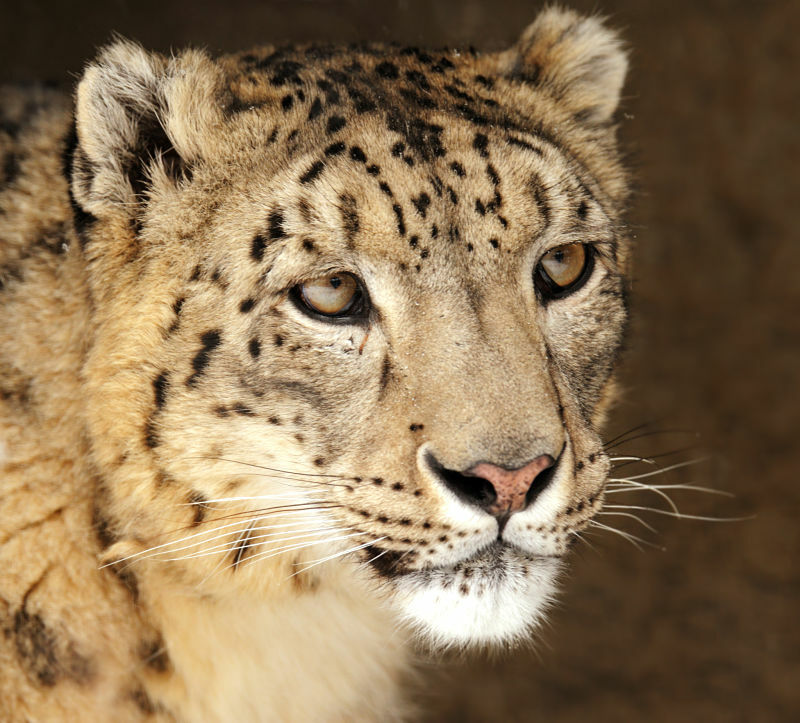 The snow leopard was discovered and officially classified in the 1700's. It was placed in it's own genus - Uncia - because of marked unique differences in skull structure. It was not classified as a big cat, not only because of skeletal differences, but because the fibro-elastic tissue that forms part of the vocal apparatus in the Snow Leopard is underdeveloped in the snow leopard compared to the "big cats". In short, the snow leopard cannot roar, and so was not considered a "big cat." The "big cats" are the lion, tiger, leopard and jaguar, the members of the genus panthera. Genetic studies done in 2007 seemed to indicate that the snow leopard was more closely related to the tiger. Another study suggested that they had, at one time, interbred with lions. 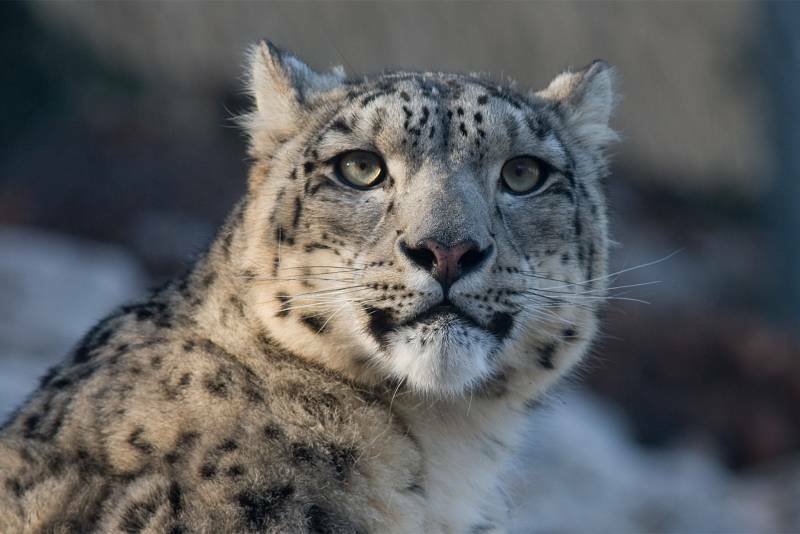 As a result of these studies, the snow leopard was reclassified. It was placed in the genus panthera, and became the fifth "big cat". There has been a general trend toward favoring genetics over physiology in recent years, but the motivation here may have been political. The snow leopards reclassification as a "big cat", may help raise awareness of the plight of this stunning animal. But science should never be stretched, no matter what the cause.